My overall summary of the show so far: other than a few episodes, it feels too much like a typical sitcom, with everything too restrained. Few elements of the classic Looney Tunes humor, or even of their TV successors (“Tiny Toon Adventures,” “Animaniacs,” “Duck Dodgers,” etc.) are seen in many of the episodes—little to no slapstick, no fourth-wall breaking, no satire or social commentary, no Acme corporation (with one fleeting cameo aside), etc. While the ‘Tunes have been shown in the suburbs before, it was usually much funnier than this series; see Acme Acres in “Tiny Toons.” The show also feels too slow-paced or “realistic”/restrained in what violence is seen, such as the fight scene in one episode. Bringing the Looney Tunes back into the public spotlight, and making them stars again. 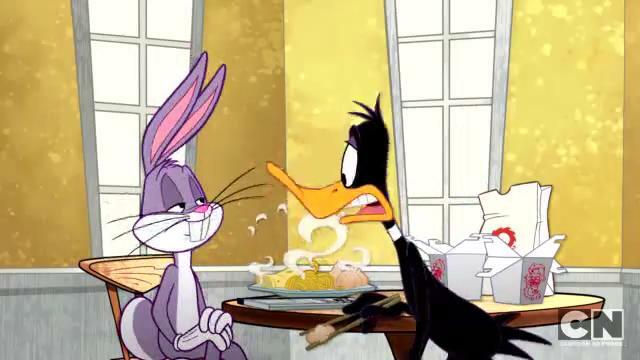 The show has gotten fairly strong (for Cartoon Network’s standards) ratings, and with that and the original shorts airing again (in the daytime hours), Bugs and company are finally back in the limelight. At the very least, today’s kids won’t stare blankly at being asked who Bugs Bunny is, so I’m grateful for that much. Porky Pig. While the “loser” card gets played up a bit too often (especially at Daffy’s abuse, here even greater than in the original shorts), Porky seems to make use well of his “straight man” status among the Looney Tunes characters, and is usually one of the funnier characters on the show. Speedy Gonzales. Speedy’s also one of the show’s funnier characters, and gets some of the better lines in episodes he appears in. They’ve also managed to lessen some of his stereotypical aspects in this show, though his trademark super-speed seems a bit de-emphasized here. Sylvester and Tweety. These two are the least changed in this series, and thus manage to keep their humor intact. The season finale highlighting them was particularly funny. Tina, the new addition to the Looney Tunes gang. While I’m disappointed Petunia Pig wasn’t seen this season (despite appearing in the show’s promotional artwork), Tina is a nice addition, while being more likable than this show’s Lola. The “Merrie Melodies” and the Road Runner shorts. Even in the most banal of the show’s episodes, these two segments are usually the high point. The song numbers range from “OK” (Tweety’s “Yellow Bird”) to hilarious (Speedy and Porky’s song number in the season finale) to “why didn’t they make this the main show instead?” (Daffy’s “The Wizard”). The Road Runner shorts, while unfortunately in CGI, also manage to stay faithful to the characters, including the usual mishaps to the Coyote and use of Acme gadgets, now ordered via the Web. The first two of those episodes were leftovers from the show’s initial writing attempt, which ironically was more faithful to the classic shorts/previous TV efforts before being retooled into a sitcom format. The third, while more reflective of the show’s usual format, has more slapstick/comedic moments to it than usual. Unfortunately, since the show did well in this format, I worry season two will just bring more of the same, which reminds me of one reason why I dislike the current heavy wave of reboots: they seem bent on throwing out or changing much of what made the characters interesting or fun in the first place, and come off as generic-feeling retreads at best (or, at worst, someone’s bad fanfic idea); see: the “Star Trek” movie from a few years ago, or the various DC Comics continuity reboots (going back to Byrne’s Superman/”Crisis on Infinite Earths”). While I wish “The Looney Tunes Show” success for its second season, if it’s just going to be more of the same, I don’t think I’ll be tuning in past the first episode or two (nor blogging reviews of it anymore).